A Lego Block makes a perfect Branded shoe ledge. It is distinctive enough to maintain its identity even at a distance. 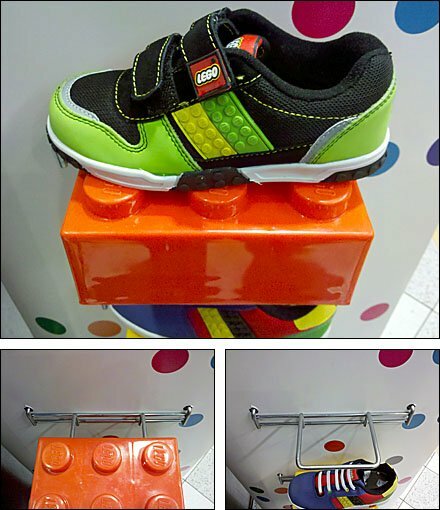 And what child, mother or Nanny can resist a Lego Shoe? Particularly after it is determined through in-store testing that Lego Blocks actually attach to the shoes themselves, albeit with effort. Note that this slide-on ledge construction allows other creations to be used as the Branding element … or none at all. SEE “Flexeez P-O-P Whatsit” for another unusual toy-based Point-of-Purchase exhibit. SELECT “Shoe” or “Toy” from the Cloud Menu to follow fixtures by channel of retail. Link out here to see other Lego POP news on POPON.NET (opens in new window) or SEE “Literature Holder Sells Legos Instead” her on FixturesCloseUp.